Using JSON RESTful Web Services with Salesforce.com opens up your org to a number third-party integration opportunities (Google, Yahoo!, Flickr, bespoke, etc.). JSON support isn't baked into the Force.com platform but Ron Hess at Salesforce.com has created a JSON parser which will do the heavy lifting for you. Last month I wrote a blog post and example of how to call a REST Web Service with Apex that returns and consumes XML. It was my intention to do the same demo using JSON, however, I ran into a small sang. I couldn’t get the Apex JSONObject parser to work. I tried on and off for a couple of days but couldn't beat it into submission. I checked around the twitter-verse and no one reported much success using the JSON parser with complex objects. I finally cried "uncle" and called Ron and asked for help. Ron was extremely responsive and over the course of a couple of days we worked worked through some of the parsing issues and finally updated the Google project with the changes. To get started, you'll need to download the JSONObject class and install it into a Developer org or Sandbox. Unfortunately there is no documentation for the parser so you have to extrapolate from the json.org website. You'll also need to sign up for a Google Maps API key in order to use their geocoding service. I would also recommend that you take a look at the docs for Google Maps geocoding service. The Visualforce page is fairly simple and presents the user with a form to enter their address. 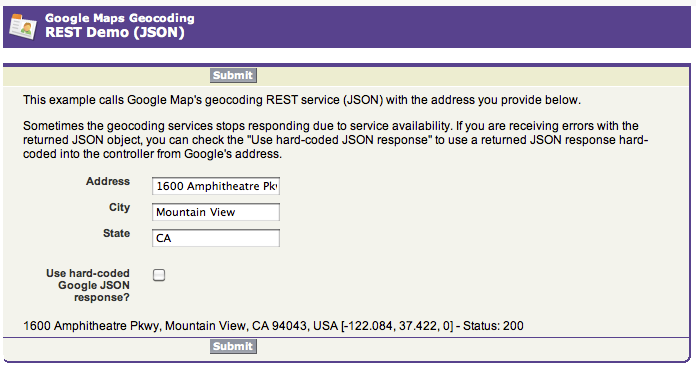 If the geocoding services is experiencing issues, the user can check "Use hard-coded Google JSON response?" and the Controller with use the hard-coded JSON response instead of making the GET call to the geocoding service. Once submitted, the address is processed and the outputPanel is rerendered with the resulting address and coordinates. I also found this nifty JSON viewer which makes debugging less painful.